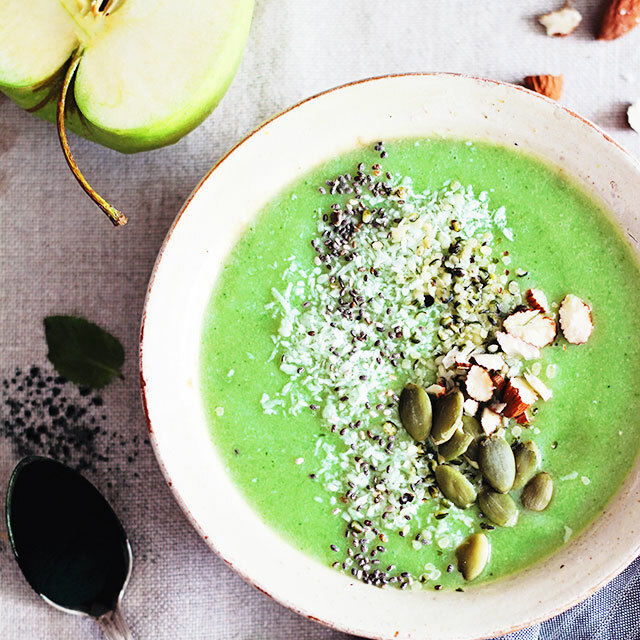 Sometimes a glass just isn’t the right container for a smoothie, which is the case for my green apple and spirulina detox smoothie bowl. All the goodness of a smoothie plus some extra add-ins to help your detox even more. Smoothies are my favorite way to start the day fresh, and when I have enough time to turn them into a creamy, nourishing, and detoxifying breakfast bowl I know my day is going to be just great! 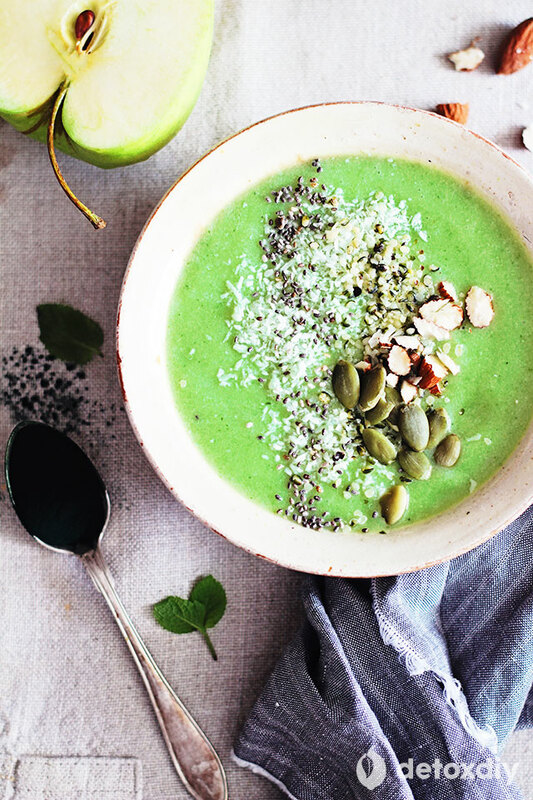 All the fresh fruits and veggies are loaded with enzymes to sustain your body’s natural detox function, but you can boost the nutrition levels by adding a superfood like the spirulina in this cleansing smoothie bowl. 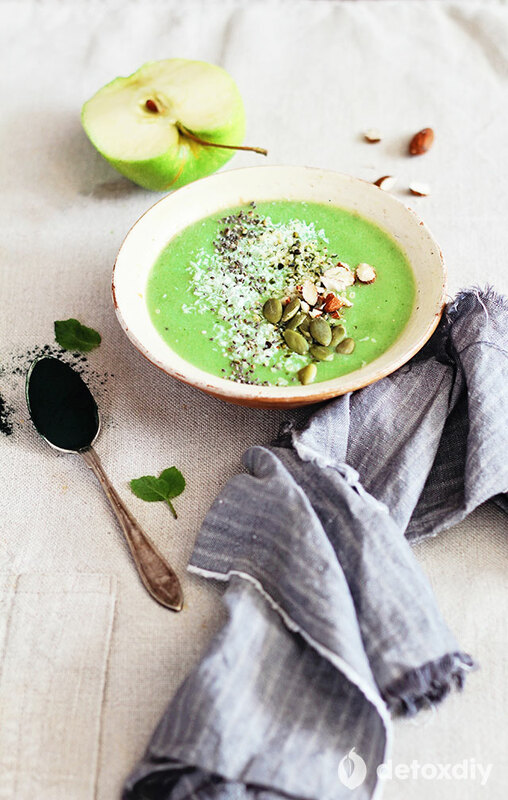 Algae like spirulina or chlorella are a great addition to your daily diet, and you can easily disguise their distinct flavor by combining them with fresh fruit, which works really well in this smoothie bowl. Give it another go if you’ve tried taking spirulina in the past but couldn’t get over the taste. Spirulina is a blue-green algae and also one of the most complete foods, with a nutritional array covering everything your body needs to be healthy and active. Vitamins, minerals, essential fatty acids and loads of chlorophyll to boost the detoxifying activity within your body’s cells and immune system. It contains all the essential amino-acids your body needs for building protein, and also Vitamin B-12, very rare in the plant world, making it a great add-in for vegetarians and vegans. ● Vitamins and minerals – B Vitamins (including folic acid and B12), beta-Carotene, Vitamin D, along with magnesium, potassium, selenium and zinc minerals, and high quantities of iron. ● All nine essential amino-acids, creating the perfect building blocks for your body to make protein. ● The antioxidant enzyme superoxide dismutase (SOD) in bioavailable form. ● A wide array of antioxidants, from chlorophyll, beta-carotene and phytocyane, all contributing to healthy cell function and reducing the damage caused by free radicals. 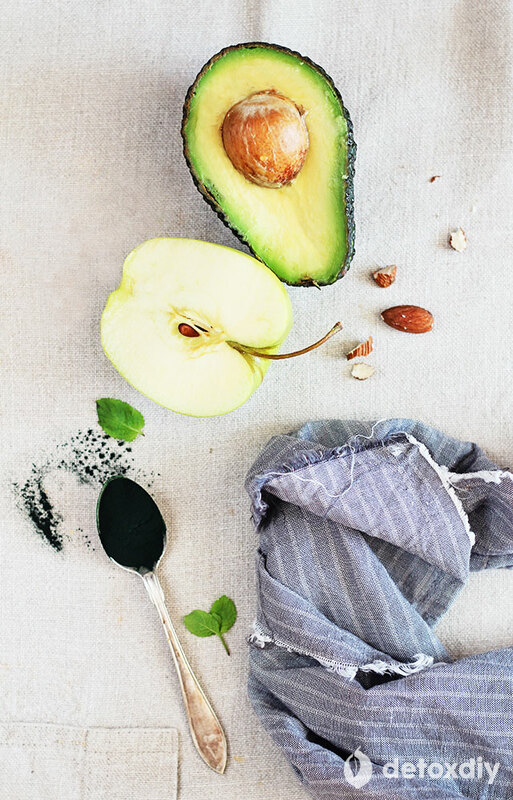 This creamy smoothie bowl contains highly nutritional and detoxifying ingredients: spirulina for a detox boost, avocado for minerals and fiber, green apple for its high Vitamin C content and soluble pectin fiber, and almond butter for healthy monounsaturated fats and an extra kick of minerals. If you don’t have time to make it for breakfast in the morning, it makes a great anytime snack and I’ve even had it for a light dinner after having a larger lunch. It’s pretty versatile, and because everything is kept in raw form it’s extra nutritious for the body. Blend all ingredients until creamy, distribute into serving bowls, top with mixed seeds and coconut flakes and serve.